Once the invasion force was ashore the engineers of the Provisional Engineer Special Brigade Group entered upon a three-phased schedule for organizing beach supply operations. The first two phases were tied directly to the tactical situation since they involved setting up dumps on the beaches and later moving the dumps to protected sites as much as four miles inland. The last phase would begin with the completion of the MULBERRY, an artificial harbor to be made of sunken blockships and concrete caissons offshore, providing more efficient discharge of cargoes and men directly from pierhead structures to the beaches at OMAHA via floating roadways. UTAH, with more limited constructed facilities serving it, would continue to receive heavy traffic in men and matériel from lighters, the various landing craft, makeshift Rhino ferries, and barges plying between larger vessels and the beach. 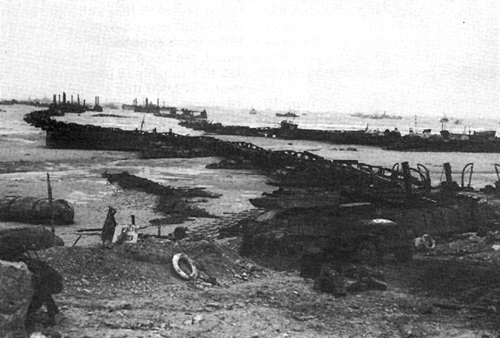 Gradually, as captured ports came into service, the logistic load would shift there, and the MULBERRY complex would close down before the autumnal storms interfered with the operation.1 No clear-cut dividing line separated these activities, and, in fact, they tended to overlap each other as shore engineers developed the supply system. While the engineers organized the beaches into administrative subdivisions, providing roads to the water's edge and laying out supply areas just inland, Transportation Corps troops would help unload cargo, move supplies to depots or using units, and control traffic on and behind the beaches. The Transportation Corps would also operate smaller captured ports in the area once the engineers had cleared obstacles and mines and restored dockside equipment and storage space. units reset the locks there to draw off the flood behind the southern end of the beach, the terrain was still too marshy to support the weight of large amounts of supplies and the vehicles necessary to move them. Confusion offshore and unbending adherence to the NEPTUNE plan added to the delay in unloading. Until D plus 4 First Army plans called for the discharge of items according to a rigid priority system. But shipping manifests identifying priority cargoes and vessels did not reach the proper hands among Transportation Corps crews or the Navy officer in charge of beach operations. Engineer brigade officers at first joined naval officers and transportation troops in small launches in time-consuming searches for specific ships but later simply took the nearest vessels ready for discharge. The Navy refused to beach LSTs for fear of German artillery fire at UTAH and in the belief that they would break their keels as they settled onto the uneven tidal flats. Once the latter worry proved unfounded, LSTs after D plus 2 "dried out" regularly-the vessels would ground just after high tide, discharge their cargo onto the dry flat after the water receded, and pull off again with the next tide. This method slowed the shipping shuttle between the beaches and the mounting out ports in southern England because it took twelve hours to refloat the craft. Nevertheless, it did more than any other single expedient to reduce the shipping backlog off Normandy and to boost the lagging discharge rates of troops, supply, and vehicles before segments of the MULBERRY harbor came into full service. Beach maintenance dumps of the 5th and 6th Engineer Special Brigades, located along the Isigny-Bayeux road, were ready for operation on 13 and 14 June. By then the fields were clear of mines and, after the capture of Trevieres on 10 June, of enemy resistance except for scattered sniper fire. The dumps were located in a series of relatively small fields divided by hedgerows, small trees, and drainage ditches. The engineers filled the trenches and cut gaps through the hedgerows to allow trucks to move from field to field and to relieve congestion on narrow roads. impetus from the gradual completion of artificial harbor installations and their protective breakwaters-a line of sunken ships known as a GOOSEBERRY. Naval construction elements opened two 2,450-foot causeways on each of the major invasion beaches by 10 June, the spans at OMAHA coming in at Exits E1 and F1. Two days later, when General Bradley stood on OMAHA, the sight of the massive construction off the beaches convinced him that the invasion area had become the major port of Europe. Unloading slowed to a crawl from 19 to 22 June while a howling Channel storm tore the harbor apart, driving smaller vessels into causeways, pierheads, and whale structures and casting the wreckage ashore in tangled heaps of caissons, coasters, and landing craft. The engineers managed to get a total of 2,557 long tons of cargo out of beached craft during the four days. In several cases, as with the coaster Highware, the men resorted to cutting holes in ships' sides to get at the holds. The more fortunate British MULBERRY, farther east, rode out the storm without extensive damage. 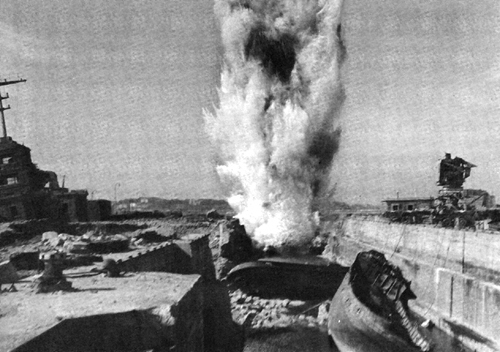 The debris at UTAH was not heavy, but the engineer brigades at OMAHA faced the same beach clearance problem on 22 June that they had on the seventh. Clearance and salvage now vied with the rush to unload necessary men and supply in the days after the storm. 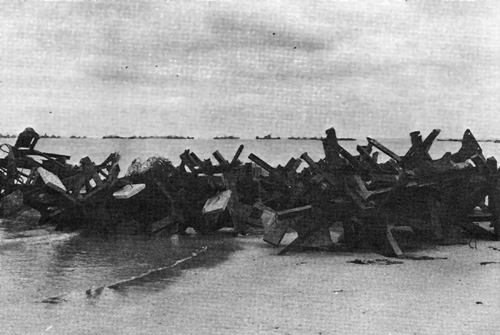 All LSTs dried out on the Fox beaches at OMAHA, where there was less wreckage. By using every available LCT, LCM, and DUKW to ferry material from ship to shore, the brigades began to realize a potential for moving supply and troops across an open beach that the planners apparently had not recognized. DUKWs, which had all escaped the storm's effect by hastening ashore to wait out the weather, were invaluable at both beaches. Tonnage figures exceeded the planned daily tables consistently between 24 and 30 June although the discharge rate never caught up with cumulative figures expected. By the end of the month the troop buildup had reached 452,460, roughly 78 percent of the estimated 579,000 that should have been ashore on that date. Supplies amounted to 80 percent of the 360,000 long tons scheduled, and the 70,910 vehicles unloaded were only 65 percent of the 111,000 First Army expected by D plus 24. Despite the lag, the engineers had recovered remarkably well from the devastation of the storm and had sustained operations on the beaches as the fighting moved toward Cherbourg and, south of the beaches, into the hedgerow country of Normandy. In the meantime some measure of help in supplementing the over-the-beach supply operations came with the rehabilitation of several minor ports in the area. Access to Grandcamp, a small fishing port and summer resort about five miles west of OMAHA, was through a fifty-foot-wide channel between two jetties. The jetties extended from the beach for about 350 feet to the port proper, a rectangular artificial basin with a concrete wharf and one quay. From the information available, planners had estimated the minimum high-tide depth of channel and basin at eight feet, making it possible to bring in LCTs and small coasters. Because the little port was so vulnerable to enemy demolitions the engineers were not sure that it could be used at all, but they hoped it could be opened by 20 June, with a goal of 500 tons of cargo daily thereafter. A TC port company, a quartermaster truck platoon, and an administration detachment from Headquarters, 11th Port, were to operate Grandcamp port. Isigny, a somewhat more prepossessing port, was a small dairying town on the Aure River near where the river flowed into the Vire about ten miles west-southwest of OMAHA. To reach the port from the sea, ships entered the mouth of the Vire and after about three miles turned left into the narrow Aure, which for three-quarters of a mile formed the port channel. Lined on the right almost continuously with stone quays terminating in a small turning basin, the channel contained two or three feet of water at mean low tide and about thirteen feet at high tide, a depth adequate for coaster operations. At no time did the small ports, combined, approach the 12,000 tons of cargo per day the logisticians had hoped for. Such a total might have been achieved had the ports been developed more fully, but this step was not necessary. OMAHA and UTAH beaches proved surprisingly successful in delivering cargo, and by early October, when autumn storms showed the need for phasing out beach operations, the engineer port reconstruction effort had concentrated at Cherbourg. There, during most of the autumn of 1944, was to be discharged the bulk of the supplies required to support American forces. By 16 October 1944, Grandcamp, Isigny, St. Vaast, and Barfleur had closed down; on 9 November they reverted to French control. By this time a rear area system of base sections was in place under the COMZ command of General Lee, who took over active control of the rehabilitation efforts at the theater level. ports, and inland waterways and handled all mapping problems, including liaison on maps with Allied forces. The division also kept current on enemy engineering methods, mine warfare and field works that combat engineer were likely to encounter. The Real Estate and Labor Division dealt wit the acquisition of property for military use and hired civilian labor. Theater policies on engineer troop strengths the distribution of engineers within the theater, and revisions to standard table of organization fell within the jurisdiction of the Troops Division. It also handled training and the general technical supervision of bridge building, demolitions, camouflage, water supply, and fire fighting. The Supply Division saw to the engineer logistical line of communications on the Continent and the management of the entire theater depot system and the inventory and stock levels in it. The Construction Division set engineer construction standards and supervised the rehabilitation or building of roads, installations of all kinds pipelines, power systems, and waterways.15 The chief engineer's technical control extended, therefore, to the base sections on the Continent and in the United Kingdom, where all of the former base sections were consolidated into a single United Kingdom Base with subordinate districts. 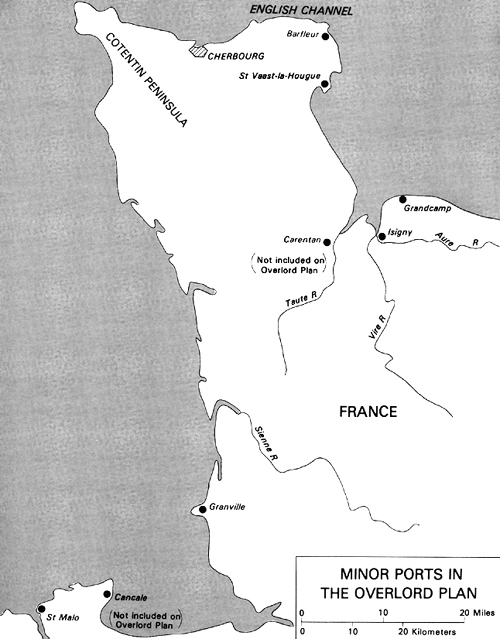 to a close, Normandy Base Section had progressively absorbed Brittany Base and taken over the Channel coast from Brest to the 21 Army Group boundary. Channel Base remained responsible for American supply and administration in what was a British rear area, where British forces retained a small enclave in Normandy Base Section incorporating their original D-day beaches. The port of Cherbourg in the meantime had developed into one of the principal points of entry for American forces and supply. A naval installation occupied most of the western side of the inner harbor. Between the naval base and the Quai de France the ADSEC officers saw a small seaplane base, a bathing beach (the Nouvelle Plage), and a narrow channel leading inland to two basins in the center of the city, the Avant Port de Commerce and the Bassin a Flot, where in peacetime most of the cargo handled at Cherbourg came ashore. The eastern side of the harbor, beyond the Darse Transatlantique, was the least developed. It consisted merely of open areas known as the Reclamation and the Terre Plein, bounded by a long sloping seawall where the water was quite shallow at low tide. The destruction of Cherbourg, while acknowledged to be "a masterful job," was no greater than the ADSEC engineer had expected.19 The engineers were to work first on those areas where the quickest results could be expected, so that construction machinery and equipment waiting off UTAH Beach could land as soon as possible. These areas were designated in a four-point program established by naval, engineer, and transportation officers on 28 June: first, the Nouvelle Plage bathing beach for DUKWs; second, the Bassin a Flot in the commercial port for barges; third, the Reclamation and Terre Plein area for LSTs; and, fourth, the Digue du Homet for Liberty ships and vessels carrying locomotives and boxcars. At Nouvelle Plage the engineers blew gaps in the seawall, swept away barbed-wire entanglements, graded the beach, and built three concrete exit roads for DUKWs. Work started early on ramps and hards for vehicle-carrying LCTs and LSTs at the seaplane base and the north side of the Reclamation area. The engineers quickly constructed timber wharves for unloading barges and coasters along the Terre Plein and at the Bassin a Flot, which had seventeen feet of water controlled by locks at the inner end of the Avant Port de Commerce. A swing bridge over these locks, which carried traffic from one side of the city to the other, was down; the engineers replaced it with an ingenious retractable drawbridge-a movable Bailey resting on dollies that ran on old streetcar rails. noon on 16 July and anchored safely in the Grande Rade. By 1738 a load of signal corps wire had been placed into a waiting DUKW; forty-five minutes later, it was on its way by truck to a signal corps dump five miles south of Cherbourg. Port operations had begun. The first cargo was not typical, for DUKWs normally handled only small packages and in later operations were used almost exclusively for subsistence. Sixty-three percent of all supplies and equipment that came into the port before the end of July bore the castle marking of the Corps of Engineers, and much of that cargo consisted of construction materials for rebuilding the port. Barges had to bring in heavy engineer equipment such as girders, rail lengths, and bulldozers. Thirty 18-by-16-foot wooden barges arrived shortly after the first Liberties, loaded at once, and the next day, 17 July, discharged in the Bassin a Flot, the wet dock at the commercial port. Meanwhile, work on the high-priority Digue du Homet, begun the week after Cherbourg's capture, was well along. The 332d Engineer General Service Regiment and other engineers filled a crater isolating the Digue from the naval base, repaired road and railroad tracks on the Digue, and constructed five pile-and-timber finger piers for Liberty ships because the quay wall had an underwater shelf. At the shore end of the Digue the engineers provided two berths for Twickenham ferries, British vessels specially built to carry locomotives and rolling stock. On 29 July a Twickenham made its first delivery-several 65-ton diesel electric locomotives and other rolling stock. 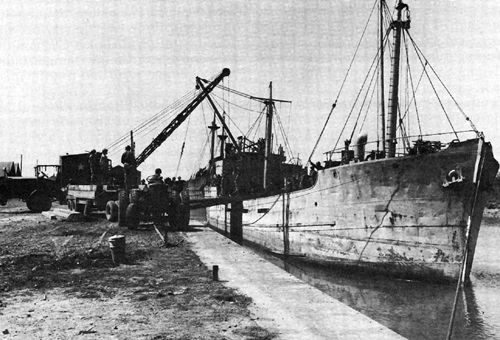 The first Liberty ship docked at one of the Digue's finger piers on 9 August. After 13 August, when the 332d Engineer General Service Regiment moved to Mayenne to undertake railroad repair in support of First Army's Falaise Gap operations, the 342d and 398th Engineer General Service Regiments took over the work at the Quai du Homet and Digue du Homet. Efforts to provide more deepwater berths increased when it became obvious that the lighterage operations-discharged into DUKWs or barges from ships anchored out in the roadstead-were too costly in labor, equipment, and time. DUKWs had a limited capacity; barges could be towed into basins only during a few hours at high tide and otherwise had to be moored to stake boats in the harbor. Moreover, all lighters were at the mercy of the weather, and storms frequently prevented them from venturing out into the harbor. captured special railroad cars. Eventually the naval base provided berths for eleven Liberty ships and five coasters. After the debris and mines were removed from the quays at the Darse Transatlantique, the 333d Engineer Special Service Regiment began construction. 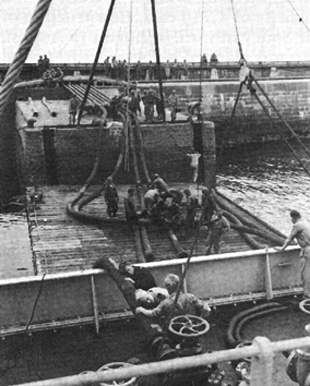 Operating two ten-hour shifts and employing hundreds of French civilians and POWs, the regiment first built finger piers at intervals to match the hatches of Liberty ships; later they filled the spaces between the piers, using timber wharfing to provide continuous berthing along the Quai de France. But construction in the Darse was a long-term project. Not until 21 August, when the Navy declared the waters free of mines, could a survey of underwater debris be made. An access channel was not open until 18 September, and the first Liberty did not berth in the Darse until 8 October. In the OVERLORD plan Cherbourg originally had a scheduled daily discharge capacity of 8,000 to 9,000 tons-Brest and Quiberon Bay were to become the major ports of entry for Allied forces and supplies entering the Continent. But as the bitter German defense of some Brittany ports increased Cherbourg's importance, G-4 planners raised the port's projected intake capacity to 15,000 tons daily in July. Brig. Gen. Royal B. Lord, ETOUSA G-4, expected a 20,000-ton capacity in the city by September, but in the middle of that month only 12,000 tons per day were moving through the port, then about 75 percent rehabilitated. The vital berths that could handle Liberty ships still lay in the inoperable 25 percent of the harbor, and their repair continued even as the utility of Cherbourg declined later in the year. Efforts to expedite rail service had started before the fall of Cherbourg, when the 1056th Engineer Port Construction and Repair Group began to repair demolished railway bridges over the Vire, Taute, Madeleine, and Jourdan Rivers. By 7 July the two main line tracks from Paris to Cherbourg were open. One company of the 347th Engineer General Service Regiment had cleared a demolished tunnel just south of Cherbourg, and three other companies had repaired blown frogs and switches on the tracks into the city's railway station, the Gare de l'Etat. Fortunately damage was light on a mile-long spur from the Gare de l'Etat to the Digue du Homet, and less than five of the fifteen miles of track within the city needed extensive repairs. Most of the damage had resulted from Allied bombs and artillery fire. 350 cars and marshaling yards for only 400. The plan to move 20,000 tons daily through Cherbourg required 2,000 railway cars a day, and since a two-day supply of empty cars had to be on hand at all times, storage for 4,000 cars as well as marshaling yard capacity for the daily 2,000 was mandatory. The same problem occurred in the construction of new yards at Couville and Sottevast, which together constituted one of the most ambitious construction projects undertaken on the Cotentin. Work at Couville began on 2 August, but heavy rains turned the area into a sea of mud. The engineers had to open a rock quarry and haul hundreds of carloads of rock to ballast the tracks. The first yard at Couville opened on 18 September, and expansion continued until 3 November, when the yard had sixteen miles of track with a capacity of 1,740 cars. Construction of the Sottevast yard, begun on 15 August, also was plagued by heavy rains that at one time had portions of the area under eighteen inches of water. Nevertheless, some of the facilities were ready by mid-October, and when construction stopped in mid-December the yard had eighteen miles of track with a capacity of 2,280 cars. On 24 July the tanker Empire Traveller discharged the first gasoline at Cherbourg, unloading at the long breakwater in the outer harbor-the Digue de Querqueville. The French and later the Germans had discharged gasoline and other POL supplies through a nine-inch pipeline running along the Digue to two nearby tank farms at the large Depot Cotier du Petrole and the somewhat smaller one at Sunic. In the same neighborhood was a tank farm at Hainneville, which the French Navy had used to store diesel fuel. The fourth farm the Americans discovered was underground, so cleverly concealed that even few Frenchmen knew of its existence. The French had built the installation, Les Couplets, in 1938 at the time of the Maginot Line construction. Double garage doors of an innocent-looking two story house facing the Rue de la Paix, which skirted the harbor between Cherbourg and Querqueville, opened on a 600-yard tunnel leading to four huge storage tanks located in a hollow carved out of a small mountain; thirty-eight feet of solid granite overhead made the tanks impervious to air attacks. GASOLINE BEING PUMPED ASHORE at Cherbourg. On 4 November 1944, Cherbourg discharged a peak 19,955, tons of cargo; the daily average for that month was 14,300 tons. Thereafter, the port's discharge rate declined rapidly as personnel, equipment, and railroad cars transferred to Antwerp. A few days after supply ships entered Antwerp on 26 November, Cherbourg's tonnage target dropped to 12,000 tons a day; two weeks later it went down to 7,000 tons. Cherbourg's role as the mainstay of the American port system in France was over. its opening on 15 September 1944 and its closing on 21 April 1945. Its prosaic activities were violently interrupted shortly after midnight on 9 March 1945, when a German task force of about 150 men from their isolated garrison on the Channel Islands raided the little port, causing about eighty casualties and damaging coasters and port facilities. Morlaix (situated about twelve miles up the Dossen River estuary) and the small neighboring port of Roscoff were the westernmost of the Brittany ports. Consistently linked in all plans, they were operated by one headquarters and were referred to as one port, Morlaix-Roscoff. Though Roscoff was tidal, Morlaix, like Granville, had outer and inner basins. Neither port was badly damaged, and the 1057th Engineer Port Construction and Repair Group quickly restored them. The two provided anchorage for six Liberty ships that discharged into lighters. Between the opening day, 5 September, and the closing date of 14 December 1944, Morlaix-Roscoff turned in the best performance of any of the Brittany group of ports-2,105 tons a day. An engineer task force under Col. Frank F. Bell, commanding officer of the 373d Engineer General Service Regiment, undertook limited rehabilitation of both Le Havre and Rouen. In addition to his own regiment, Colonel Bell ultimately had control of the 1055th and 1061st Engineer Port Construction and Repair Groups, the 392d Engineer General Service Regiment, the 1071st Engineer Port Repair Ship Crew, the 1044th Engineer Gas Generating Unit, the 971st Engineer Maintenance Company, and the 577th Engineer Dump Truck Company. He also had under his operational control two Royal Navy parties, each equivalent to a US Army engineer port construction and repair group. The 373d Engineers, moving by motor convoy from the outskirts of Brest. arrived in Le Havre on 19 September. Road and mine clearance work started the next day while, offshore, naval salvage crews began clearing an entrance into the harbor. As at other ports the engineers first worked to provide the earliest possible discharge of cargo, making space on the beaches for landing craft, clearing storage areas, and preparing exits through rubble-filled streets. The engineers built no timber pile wharves but instead installed a number of artificial piers to provide berths for deep-draft ships. One was a floating ponton pier the Navy built; the Army engineers provided the connection with the shore-Bailey bridges 130 feet long that moved up and down with the tide.31 Two of the artificial piers used four Phoenixes originally designed for the MULBERRY project. Another ingenious use of existing materials was the employment of Phion ferries, left over from operations on the D-day beaches, to construct floating piers in the port's wet basins. quay walls. To stop this deterioration and to make the basins usable at all stages of the tide, the 1055th Engineer Port Construction and Repair Group repaired the Rochemont lock gates, one of the outstanding engineering achievements at Le Havre. Failing in several attempts to repair the huge gates where they hung, the engineers removed them and repaired them in dry dock. The rehanging was completed on 30 November 1944, and thereafter the tidal range within the wet basins fell by nearly twenty feet. Later repairs along the Tancarville Canal, which connected with the Seine, increased the stabilization. Rouen, the third major port American forces reconstructed in Europe, was not as badly damaged as Le Havre. Although the Germans had demolished cargo-handling facilities and blocked the river channel by sinking a number of ships, the quays were in good condition-some 14,000 feet were usable. On the land side, the marshaling yards adjacent to the port had suffered heavy bomb damage. This presented no particular problem because other marshaling yards twelve miles away were easily accessible over a four-lane highway. In peacetime, two-thirds of the traffic between Rouen and Paris moved by inland waterways along an eight-foot-deep channel in the Seine that could handle barges up to twenty-one feet wide.33 The largest task of rehabilitation at Rouen-the removal of mines, sunken cranes, ships, barges, and tugs from this river channel-fell mainly to the US Navy, aided by French authorities. The engineers removed debris and filled in bomb craters. Elements of the engineer task force in Le Havre, consisting of the 1061st Engineer Port Construction and Repair Group, a Royal Navy party, and a platoon of the 37th Engineer Combat Battalion, undertook these tasks. A visit to captured Antwerp, according to a British engineer who had viewed the battered ruins of other harbors, was "a startling experience. "36 The great port, ranking with New York, Hamburg, and Rotterdam, was in miraculously good condition, thanks to the speed of the British advance and Belgian success in forestalling German attempts at demolition. lock controlling the Kruisschans sluice, the longest of four sluices connecting the wet basins with the river and the only one leading into the American area. A-German mine had damaged one of the gates. The 358th Engineer General Service Regiment began work on the vital sluice on 6 November in cooperation with the British. The fact that the sluice had both flood and ebb gates made repair possible in plenty of time for the first American Liberty ship to enter on 28 November.38 American engineers also removed sand, rubble, and damaged cranes from the quays, improved quays and roads, constructed hardstandings and trackage, and rebuilt dockside warehouses. After buzz-bomb and rocket attacks and German successes in the Ardennes raised the possibility that Antwerp might be wholly or partially denied to the Allies, British and American planners decided in mid-January to open the port of Ghent as a standby, making much the same sort of agreement on joint use as at Antwerp. The American allocation was 7,500 tons a day, to be cleared primarily over inland waterways and railroads; the British quota was set at 5,000 tons. of operations. This rate more than doubled in March, and in the final month before V-E Day an average of 9,500 tons a day was discharging at Ghent. For all their accomplishments in port reconstruction in Europe following D-day, the engineers were never really able to keep up with the demands of harbor improvement until well into the spring of 1945. Statistics on discharges of ships showed continual increase, but the shortages of berthing capacity for vessels on the Continent and the inadequate depot system for bulk supply in the theater contributed heavily to the supply crises during the latter part of the year. Basing estimates on combat requirements instead of on port capacities, General Lee's COMZ headquarters consistently overstated the number of ships the logistical structure in the ports could handle in a single month. The excess shipments created a bottleneck at that point in the supply chain. Without unloading capacity, the ships piled up offshore, remaining idle as floating warehouses instead of returning to more efficient use in the shipping pool on the high seas. Only with the capture and the eventual development of Antwerp and Ghent did the backlog clear up and the port capacity grow to a size large enough to support the last drive into Germany.